This graphic illustrates the pointing and shows the data from one of many observations made by the New Horizons Alice ultraviolet spectrometer (UVS) instrument during the Pluto-bound spacecraft's recent encounter with Jupiter. The red lines in the graphic show the scale, orientation, and position of the combined "box and slot" field of view of the Alice UVS during this observation. The positions of Jupiter's volcanic moon, Io, the torus of ionized gas from Io, and Jupiter are shown relative to the Alice field of view. Like a prism, the spectrometer separates light from these targets into its constituent wavelengths. "These ultraviolet datasets are spectacular, simply spectacular," said New Horizons Principal Investigator Dr. Alan Stern, of the Southwest Research Institute, who also serves as PI of the Alice instrument. "The team is ecstatic over the richness of the spectral data and what that promises to reveal about Io's complex relationship with Jupiter." Dr. Kurt Retherford, New Horizons science team collaborator from the Southwest Research Institute, said, "The Alice team aimed the instrument's field of view to simultaneously obtain spectra of three major targets in the Jupiter system: the moon Io, the ionized gas torus Io creates around Jupiter, and Jupiter itself." Io's volcanoes produce an extremely tenuous atmosphere made up primarily of sulfur dioxide gas, which, in the harsh plasma environment at Io, breaks down into its component sulfur and oxygen atoms. Alice observed the auroral glow from these atoms in Io's atmosphere and their ionized counterparts in the Io torus. "This UV observation of Io surpasses those from all previous spacecraft to visit Jupiter in terms of signal quality and wavelength coverage, and this is only the first of roughly 80 such spectra to be downlinked to Earth," said Retherford. 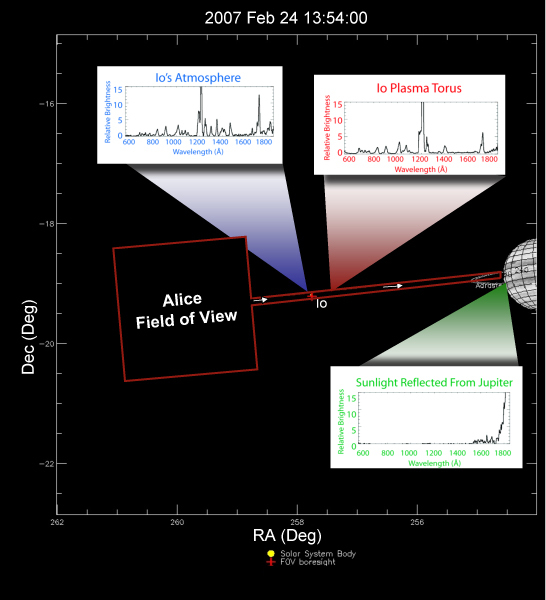 "The Alice observations of Jupiter's upper atmosphere can tell us much about the concentrations of gases there."